As reported yesterday, hot rod visionary Boyd Coddington died early Wednesday morning. Host of TLC's American Hot Rod and winner of numerous awards for his designs, his death at 63 was premature and unexpected. His company has released a statement stating that Coddington was "a long-time diabetic" who "died from complications that were brought on from a recent surgery." Honestly, we find this a bit vague, but now is the time to remember Boyd Coddington. Full details below the jump. 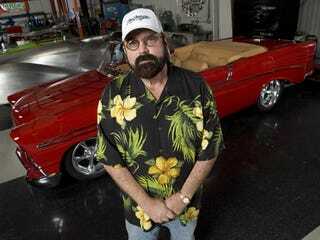 Anaheim, CA- February 27, 2008- Boyd Coddington, the creative visionary who took hot rodding to an art form and custom wheels to a new level dies at 63. Coddington who was a long-time diabetic died from complications that were brought on from a recent surgery. It was Coddingtons' ever forward-looking view at the design and art of the hot rod and his unconditional desire to create the finest quality cars that became the "Boyd Look". "It is a major loss for the automotive enthusiasts and hot rod aficionados around the world. Boyd Coddington did so much more than create automotive trends, he also built the finest hot rods. He was entertaining on his TV Show (TLC's- American Hot Rod) and an ambassador who educated. ", said Harry Hibler, former publisher of Hot Rod Magazine. Coddington who grew up in Idaho was a car enthusiast from a young age. At age 12, young Boyd traded his prized shotgun for a Model A Ford, this began the legacy of the "Boyd Look". Moving to Southern California to chase his dreams of chrome and customizing, he first worked as a shop machinist at Western Gear. Then in the 1970's, Coddington found work as a maintenance repairman and machinist at Disneyland. Coddington would recount fondly his experience at Disneyland and the companys desire for perfection, a trait that he instilled in everyone who worked at his hot rod shops. dynamics in a way that no one every had ever realized. To make the Vern Luce coupe even more dynamic was his trademark use of billet aluminum to create parts that were unique to ever hot rod. The result of his first creation was the prestigious "Sloanaker Award", the first of many. Over his thirty-year reign as the "King of Hot Rods", Coddington created dozens of hand-built hot rods and custom cars. Coddington has amassed numerous awards and was the first builder to ever win the America's Most Beautiful Roadster (A.M.B.R.) award six times. Collectively, Boyd created more respect for hot rods than ever thought possible, his hot rods have been in Museum exhibits and even the cover of Smithsonian Magazine. Coddington's innovations have become not just hot rodding touchstones, but influences that have helped the entire aftermarket industry flourish. Building cars that stand the test of time and have creative names such as CadZZilla, CheZoom, Aluma-Coupe, Smoothster, Boydster I and Boydster II set him apart from others. His client list also included ZZ Top, The Beach Boys, Van Halen's- Michael Anthony, Brad Penny of the LA Dodgers, Budweiser, White Cap, Sobe, Old Milwaukee Beer, O'Reilly Auto Parts and Hershey. Boyd Coddington was also an entrepreneur with a driven desire to build his company and see his goal become reality. In the 1980's, Boyd literally re invented the wheel by creating the billet wheel for hot rods. Coddington and long-time friend Lil' John Buttera found they could machine practically anything they needed from solid aluminum. It was Coddington who took the idea and made it commercially viable. In the 1990's, his hot rod shop and wheel company had grown and was so successful that he took the company public in an I.P.O. on NASDAQ. Boyd Coddington was less known as a father of five boys and a man who had an infectious laugh. To many he was the under-the-gun, deadline-stomping star of "American Hot Rod" a persona that led some to believe he was cantankerous. Actually, Coddington was a humble and somewhat shy individual who loved kids and was a true philanthropist. Coddington has continually employed those were mentally challenged and gave them a welcome environment to learn and work. Through his "Coddington Foundation", Boyd and his wife Jo gave to the community and an array of charities. Boyd Coddington was honored during his life as Hot Rod Magazine's "Man of the Year", he was inducted into numerous Hall's of Fame. His hit TV show "American Hot Rod" brought world wide notoriety and corporations sought his talents. The "Boyd Look" will live on and his spirit will forever remain the hot rodders inspiration.